Futures indicate a likely flat open for Tuesday (ehhh...the Dow futures has dropped 40 points since I started writing this....), tolerating weak guidance from UPS. Technicals are shaping up a little more positively for the Dow, although it has much ground to make up to get back to its 200-day MA. The 50-day MA would be an optimistic target with short term traders looking to jump ship at the 20-day MA. 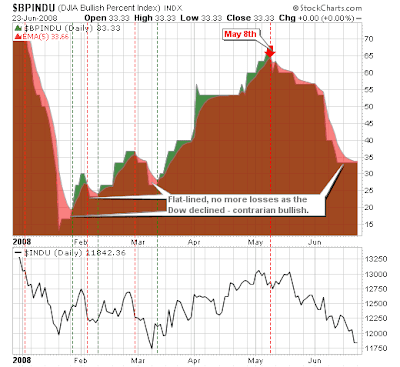 The Dow bullish percents give the best indication a bottom is in place with its flat-line action. Prior flat-lines, particularly in conjunction with a falling Dow, have been decent long side entry points. The current situation would suggest a similar long-side play is available. 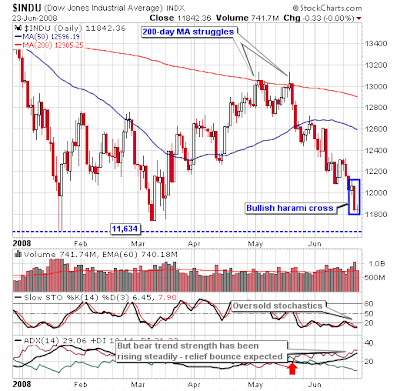 When one looks at the Dow there are indications a bounce is on the cards. 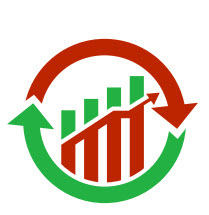 The bullish harami cross is one of the most consistent bullish reversal candlesticks; a stop on a break of the 2-day low gives adequate protection to the downside with an entry on a break of yesterday's high. 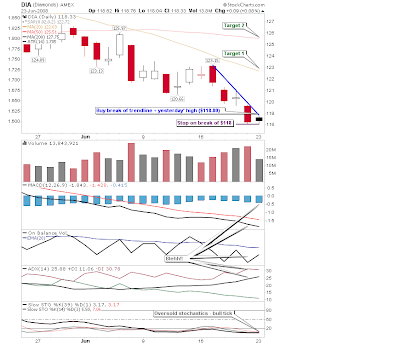 Oversold stochastics lend additional bullish weight to this candlestick-combo.